Tasted a similar frittata at a San Antonio B & B and this is as close as I can come to replicating it. I hesitate to give it a specific title because you can add as many different fillings as you can think up and each one is different. In this version, I used some sautéed spinach and mushrooms, sun-dried tomatoes and goat cheese. You can serve these mini quiche or frittata at breakfast or as a lunch 'go with' along side a bowl of soup or as a dinner appetizer. They are easy to assemble, quick to bake, and very tasty too! Wrapped in plastic, these mini frittata will keep well for three days in the refrigerator, or one month in the freezer. Preheat the oven to 325 and lightly grease a non-stick muffin tin. I use pam spray oil. 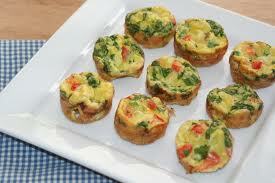 Whisk together the eggs and milk and pour into the muffin cup, diving evenly between each of the cups. These are also lunch box favorites and taste good at room temperature.